Disclaimer: Pirates for Parties in no way implys to claim any rights to the character of Jack Sparrow or the name Jack Sparrow or the name Pirates of the Caribbean. The characters and names including, but not limited to Captain Jack Sparrow, as well as the title "Pirates of the Caribbean: At World's Endl" are TM and © (or copyright) by Walt Disney, Jerry Bruckheimer and its related entities. All rights reserved. Any reproduction, duplication or distribution of trademarked or copyrighted materials in any form is prohibited. This website and its contents are in no way authorized or endorsed by Walt Disney Corp, Jerry Bruckheimer Productions, Johnny Depp, or any of their subsidiaries. Parrots4Parties is not affiliated in any way, nor do they by fact or inference imply to hold any rights or authorization, rights of association or sponsorship or endorsement of the use of any copyrights or trademarks as held by any individuals, or companies mentioned or pictured in association with any offer, including, but not limited to Walt Disney, Jerry Bruckheimer and its related entities. Any reproduction, duplication or distribution of these materials in any form is prohibited. A Pirate themed company picnic near Dallas Texas and Below a Corporate event in Rancho Mirage, CA . Some of the cities we serve in California are LA , Hollywood, Los Angeles, West Los Angeles, East Los Angeles, Pacific Palisades, Long Beach, Seal Beach, Redondo Beach, Manhattan Beach, El Segundo, Marina Del Rey,Culver City, Malibu, Palos Verdes, Torrance, Long Beach, Reseda, Pasadena, Arcadia, San Marino, Monrovia, Glendale, Burbank, Santa Monica, Brentwood, Beverly Hills, Holmby Hills, Hollywood Hills, North Hollywood, Studio City, Encino, Tarzana, Thousand Oaks, Hidden Hills, Lakewood, Downey, Pomona, Puente Hills, La Puente, Montebello, Hawthorne, Lomita, Orange County, California, OC, CA, and it's cities of Anaheim, Anaheim Hills, Orange, Buena Park, Brea, Cypress, Huntington Beach, Newport Beach, Corona Del Mar, Laguna Beach, Dana Point, SanJuan Capistrano, Garden Grove, Fullerton, Orange, Tustin, Fountain Valley, Westminster, Costa Mesa, Newport Beach, Seal Beach, Los Alamitos, Irvine, Laguna, Laguna Niguel, Mission Viejo, Aliso Viejo, Ladera Ranch, Coto De Caza, Shady Canyon, Villa Park, Orange Park Acres, Yorba Linda. Placentia, Brea, Diamond Bar, Santa Ana, Irvine, San Clemente, San Juan Capistrano, Ladera Ranch, Rancho Santa Margarita, Tustin, San Diego County, Del Mar, La Jolla, Stanton, Covina, West Covina, Pasadena, Santa Monica, Beverly Hills, Palos Verdes, Malibu, Palm Springs, San Diego, Rancho Mirage, Indian Wells, Thousand Palms, Twenty Nine Palms, La quinta, Desert hot springs, Rancho Mirage, Colton, Chino, Chino Hills, Moreno Valley, Claremont, Montclair, Temecula, Escondido, San Bernardino, Riverside, Ontario, Upland, Cucamonga, Redlands, Corona, Murrietta, Ranch Bernardo, Encinitas, Oceanside, La Meas, Chula Vista, Julian, Carlsbad, San Francisco, San Jose, Las Vegas, and other locations. We also provide service in the states of New York, Illinois, Pennsylvania, New Jersey, Conneticutt, Rhode Island, Washington D.C. Maryland, Massachusetts, Ohio, Arizona, Florida, Las Vegas, Laughlin, Reno, Nevada, Florida, Texas. For Corporate events we serve San Jose, San Francisco, Sunnyvale, Mountainview, Cupertino, Santa Clara, San Mateo, Redwood City, Atherton, We will travel anywhere in the USA. Pirates for Parties is the best producer and event planner for a pirate theme corporate event. 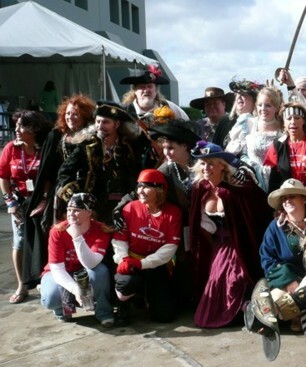 We also serve event planners as a pirate theme entertainment production company. We place pirate actors and entertainers anywhere in the United States. We have the best pirate entertainers for any kind of event or party. We produce the ultimate pirate themed party or special corporate event with music, entertainment, props, decorations, plants, staging, shows, catering, lighting, sound, parrots and exotic animals. We specialize in Caribbean themed parties and pirate parties for adults and children's parties. We work with event planners and we provide event planning and entertainment production at many public and private special events all over America.